In this ready-made activity, students interpret pictures, maps, and text describing a room in a WG apartment that is available. The other two inhabitants of the WG are looking for someone to move in to the now vacant room. The text is authentic, native German. 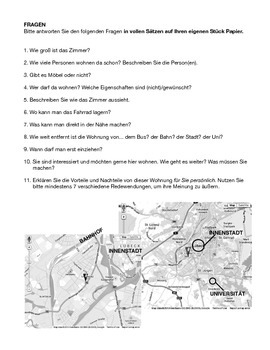 I personally use this activity with my AP students as precursor to actually using the WG-Gesucht website. 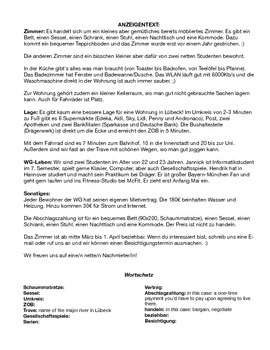 It gets students familiar again with all those words they learned earlier in German, familiar with the format of WG-Gesucht without it being overwhelming, and lets students work together (ZPD!) and allows the teacher to go around and help as needed. It is also great practice for describing things and more importantly, sharing one's opinion in a meaningful, engaging, and real-world-applicable way. The room in the WG apartment described is great because it has many advantages but also many disadvantages which allows for a lot of room for discussion with opinions and what aspects students are want/need/are willing to sacrifice for other aspects. Some of the questions check for comprehension, others ask what the next step is or what the student's opinion is. 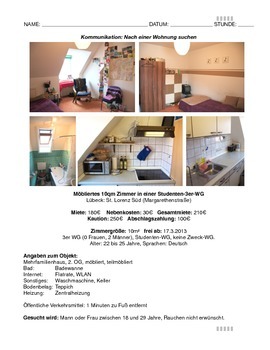 It also naturally could lend itself to a speaking exercise or class discussion of cultural comparison between living arrangements in Germany and the US.